I had noticed her on the bus. She was elegant. She had a sparkle in her eyes. She was full of life. 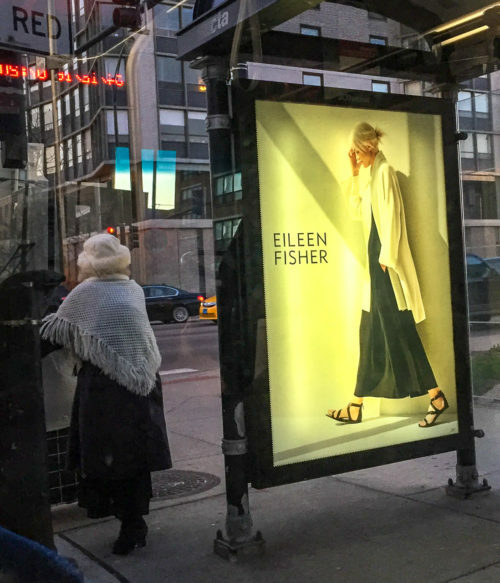 I could just imagine her 50 years ago, riding the L into the city, painting the town with her girlfriends, flirting with the men in the bars, perhaps even marching or protesting. When the bus reached her stop, she slowly got up and the other riders moved out of her way so that she could make it to the door. As she stepped down, I saw the juxtaposition of her with the model on the sign. The white shawl over shoulder contrasted with the white coat, each wearing a black skirt. In that moment I saw the elderly lady as a young woman and the young woman in her later years. It tells a story, even though it’s not the greatest photo. Isn’t that what all photos should do? This photo is part of the Scenes from a Commute gallery. Taken with an iPhone 6.